Idaleen Marie McIntyre, daughter of James M. McIntyre and Sarah Catherine Skinner, was born Aug. 28, 1868 in Grant City, Worth Co., Missouri and died Sept. 3, 1956 in Blockton, Taylor Co., Iowa. She married Ross George Roudebush Aug. 25, 1894 in Blockton, Taylor Co., Iowa. He was born Mar. 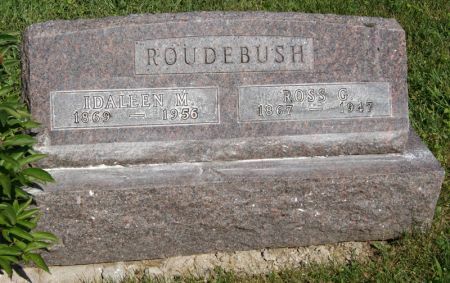 22, 1867 in Grant City, Worth Co., Missouri, son of Henry Roudebush and Maude Mills, and died July 28, 1947 in Blockton, Taylor Co., Iowa. Searching for IDALEEN MARIE "KIT" MCINTYRE ROUDEBUSH in Taylor County Iowa?